Certainly you’ve heard a song played on a radio station, but I bet you’ve never heard a song played about a radio station. Well, thanks to my antique collecting crony, I have. And would you believe it has a chiropractic connection? In our era of iPods, Podcasts, and Pandora, it’s easy to overlook its early day predecessor — the medium that started it all and forever changed a nation: radio. It’s so common place nowadays, but when you stop to think about it, radio was a big deal back in the day. Prior to the 1922 birth of radio — especially in rural America — farming families often felt isolated and disconnected from “civilization.” Most people didn’t own automobiles, so visiting the nearest neighbor meant hitching up the team. Newspapers would deliver outdated news and an evening of entertainment was usually spent with friends and family at home gathered around the kerosene lamp. Radio changed all that. 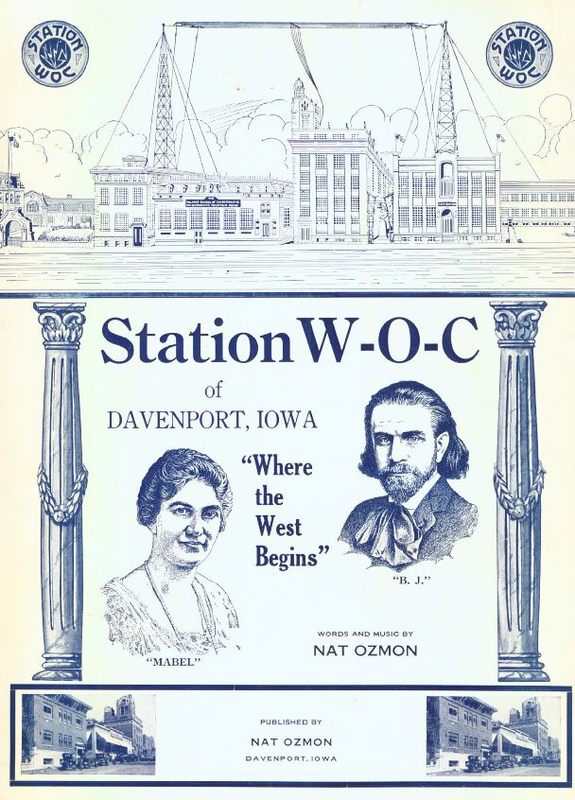 Now the box in the den would come to life each evening bringing daily news and entertainment to comfort the lonely and cheer the soul — so much so that it moved a vaudeville singer-dancer, Nat Ozmon, to compose and dedicate a song about Davenport, Iowa’s Station WOC. With an estimated one million listeners, Station WOC was one of the clearest channels that “listeners-in” would flock to. Touted as the second commercial radio station in the United States, WOC was owned and operated by none other than Dr. BJ Palmer, the son of the founder of chiropractic. Sitting atop the administration building of Palmer’s School of Chiropractic, naturally the station contained chiropractic programming. Mostly though, it played news, sports, weather, live music, farm reports, children storytime, and church service. One of the federal requirements back in the early days of radio was that “canned” music of any sort was prohibited. Good thing Palmer could draw from his strong network of friends that he had made working the vaudeville circuit as a teen. Each evening these performers would take their concerts to the airwaves — airwaves that, because of the absence of competing signals, would effortlessly travel coast to coast. It was this aspect of radio that inspired Ozmon to compose his ballad about Station WOC. The life of a vaudeville performer was understandably very lonely with the endless travel in the show’s circuit, hopping from town to town. Because of the broad reach of Palmer’s station, however, he was never alone. Just the mere fact that he would be moved to write a song about a radio station should underscore just how much of an impact this newest of technologies had on its generation. Where — In Davenport where the west begins. You can listen to this song and learn more about this fascinating piece of chiropractic radio history at SpinalColumnRadio.com, episode 105. Dr. Thomas R. Lamar is a chiropractor at Anchor Chiropractic in Kingston’s Health Services Center and is the host of SpinalColumnRadio.com. He can be reached at (360) 297-8111 or on the web at AnchorChiropractic.net. This entry was posted on August 23, 2013 at 6:00 am and is filed under chiropractic history, podcast. You can subscribe via RSS 2.0 feed to this post's comments.